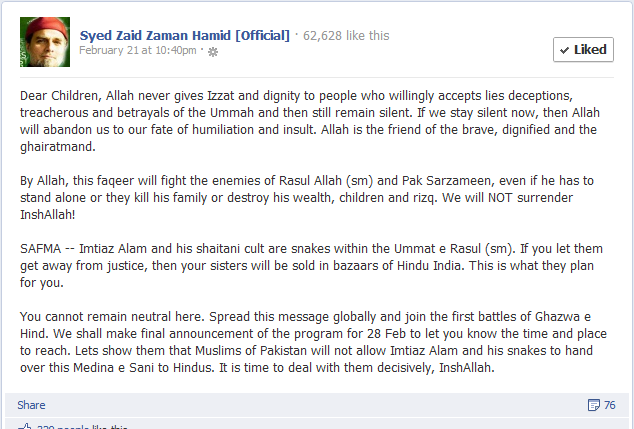 Zaid Hamid and Yousaf Kazzab share certain attributes which are universal among all cults. The Tehreek e Taliban Pakistan (TTP) is a cult no different from that of Zaid Hamid’s. There are many similarities between the two, and an understanding of them is important in order to estimate the danger Zaid Hamid poses to Pakistan. Understanding Zaid Hamid will also help understand the TTP so that an effective counter terrorism strategy can be developed. Zaid Hamid just like the TTP believes that he is on a divine mission, hence all those opposing him are enemies of the Prophet (saaw) and blasphemers. They deserve limitless punishment and eternal damnation is their fate. 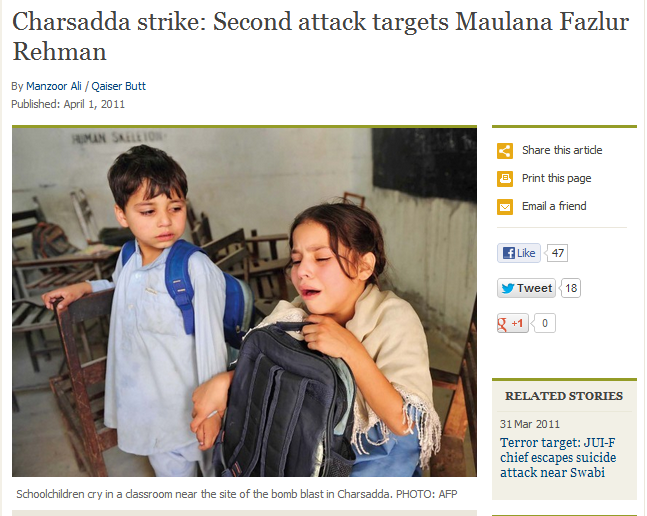 Since TTP has suicide bombers and armed militants, the fate of their enemies is much more gruesome. Here Zaid Hamid declares Imtiaz Alam and SAFMA enemies of Rasool Allah (saaw) because they sent him a defamation notice. Zaid Hamid on the other hand harasses the “enemies of RasulAllah” by cyber bullying. Many prominent journalists and intellectuals including Fasi Zaka, Hamid Mir, Hafiz Tahir Mahmood Ashrafi, Marvi Sirmed, Khushnood Ali khan, Najam Sethi and many more have been victims of his vicious cyber harassment. Zaid Hamid has on occasions used physical force as well. On many occasions students were badly beaten up during his programs who asked the wrong questions from him. This is a video of Zaid Hamid defending the beating of a student who dared to ask him a question. This is another video where senior journalist Nusrat Javed talks about another incident where thugs of Zaid Hamid started beating students when they asked a question. Not just liberal intellectuals, TTP and Zaid Hamid also share a passionate hatred for any religious scholar who questions of them. Irrespective of school of thought, the TTP has killed hundreds of scholars like Maulana Hassan Jan, Maulvi Noor Muhammad, Mufti Sarfarz Naeemi. Zaid Hamid on the other hand calls these scholars CIA, RAW and Mossad agent or congressi Khariji. Zaid Hamid is named as the suspect in the FIR for the murder of Maulana Saeed Ahmed Jalalpuri Shaheed, a known critic who first exposed his links with the false prophet Yousaf Kazzab. Zaid Hamid also started a cyber campaign against a beralwi scholar, Mufti Ghulam Sarwar Qadri who condemned him. Another similarity is that the TTP and Zaid Hamid both use the same techniques to put their message across. Both use Youtube propaganda videos as the main recruitment tool. If studied deeply it would be revealed to any one with a little background in psychology that both Zaid Hamid and TTP use covert hypnosis to create a cult like following. While the TTP uses those who fall in its influence as cheap canon fodder, Zaid Hamid uses them as free labor to build his internet image. TTP and Zaid Hamid both call Pakistan’s democratic system and its constitution as kufr. They call the Judiciary kufr and reject the legitimacy of any democratically elected government. They both call for unconstitutional means to overthrow the state. While the TTP builds up its own militia for an illegitimate overthrow of the state, Zaid Hamid wants to used the Army for this purpose ( similar to Hizb ut Tahrir). 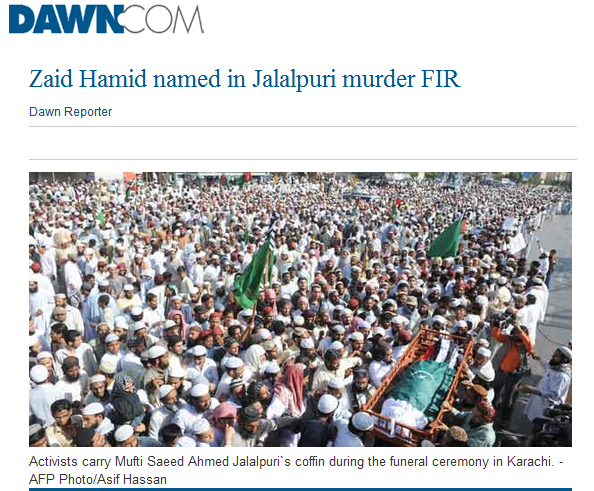 Here Zaid Hamid talks about it. Zaid Hamid and TTP both seem to share a similar passion about Ghazwa e Hind and Army of Khurasan being prepared to help the Mahdi. 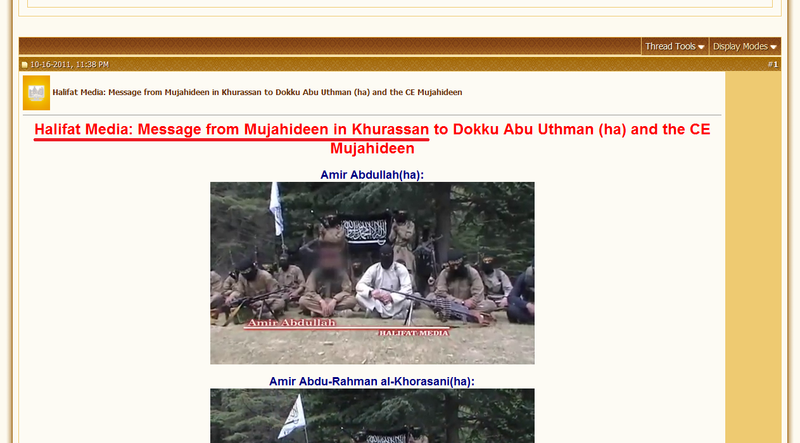 TTP calls it self the Army of Khurassan while Zaid Hamid portrays himself as the leader of Ghazwa e Hind. On many occasions Zaid Hamid has also promoted the Mahdian Army from khurassan prophecies. Being the claimants to fulfilling prophecies is another hall mark of cults which both TTP and Zaid Hamid share. 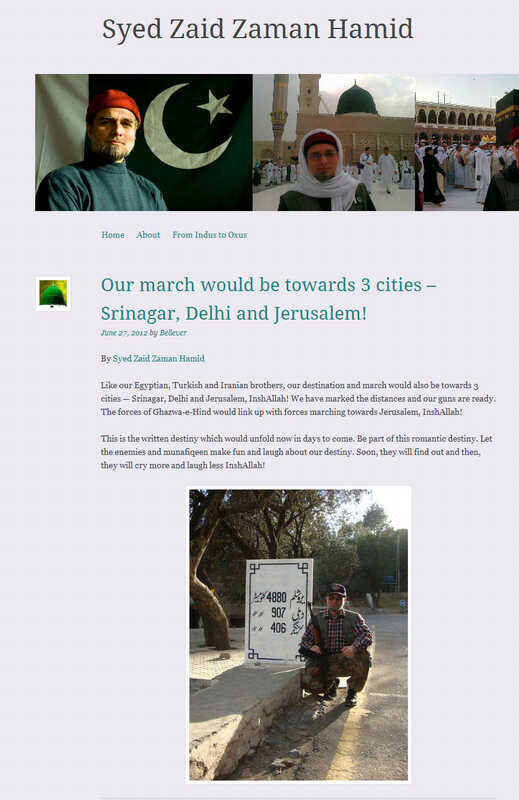 Zaid Hamid portrays himself as the leader of Ghazwa e Hind. To conclude, both TTP and Zaid Hamid have the same thinking, both are cults which aim to cease absolute power. Both have no regard for human life or democratic values and are extremely intolerant of critical voices. Zaid Hamid’s views help promote TTP’s thought. Both are a menace to the Pakistani society and are cults which have nothing to do with Islam. Zaid Hamid is a blasphemer of Prophet Muhammad (saaw) because he potrays himself self as the reincarnation of RasulAllah (saaw) to fight the Ghazwa e Hind. While the TTP commits blasphemy by claming that only its personal dictatorship is divine Law or Shariah. Thus the entire nation must rise up against this Fitna. The struggle against TTP can not succeed without winning the fight against Zaid Hamid because they are two sides of the same coin. We will win this battle only by our devotion to the Khatam un Nabiyeen (saaw) and by firm belief in the Finality of Prophet Muhammad (saaw) which will enable us to remain stead fast while facing this Fitna. This entry was posted in Deviants, Exposition, Knowledge, Pakistan, Sects and tagged Ghazwa e Hind, Khariji, Khurasan, Takfiri, TTP, zaid hamid. ← Zaid Hamid is a fake Syed. Syed is not part of his father’s name.